Bionic Vision Australia, a collaboration between of researchers working on a bionic eye, has announced that its prototype implant has completed a two year trial in patients with advanced retinitis pigmentosa. Three patients with profound vision loss received 24-channel suprachoroidal electrode implants that caused no noticeable serious side effects. Moreover, though this was not formally part of the study, the patients were able to see more light and able to distinguish shapes that were invisible to them prior to implantation. The newly gained vision allowed them to improve how they navigated around objects and how well they were able to spot items on a tabletop. The next step is to try out the latest 44-channel device in a clinical trial slated for next year and then move on to a 98-channel system that is currently in development. Brain-computer interfaces: a powerful tool for scientific inquiry. Abstract. Brain-computer interfaces (BCIs) are devices that record from the nervous system, provide input directly to the nervous system, or do both. Sensory BCIs such as cochlear implants have already had notable clinical success and motor BCIs have shown great promise for helping patients with severe motor deficits. Clinical and engineering outcomes aside, BCIs can also be tremendously powerful tools for scientific inquiry into the workings of the nervous system. They allow researchers to inject and record information at various stages of the system, permitting investigation of the brain in vivo and facilitating the reverse engineering of brain function. Most notably, BCIs are emerging as a novel experimental tool for investigating the tremendous adaptive capacity of the nervous system. A Hybrid Brain Computer Interface System Based on the Neurophysiological Protocol and Brain-actuated Switch for Wheelchair Control. 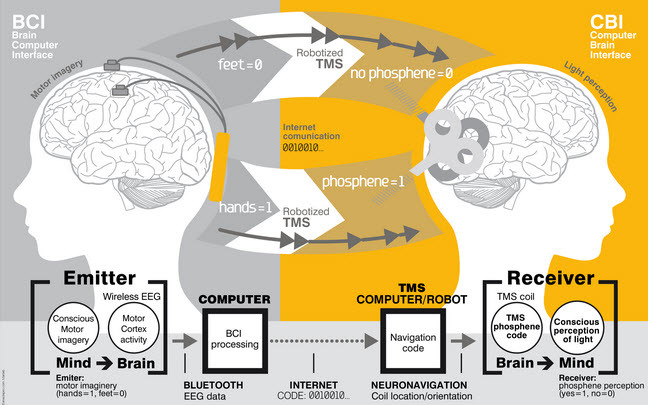 BACKGROUND: Brain Computer Interfaces (BCIs) are developed to translate brain waves into machine instructions for external devices control. Recently, hybrid BCI systems are proposed for the multi-degree control of a real wheelchair to improve the systematical efficiency of traditional BCIs. However, it is difficult for existing hybrid BCIs to implement the multi-dimensional control in one command cycle. NEW METHOD: This paper proposes a novel hybrid BCI system that combines motor imagery (MI)-based bio-signals and steady-state visual evoked potentials (SSVEPs) to control the speed and direction of a real wheelchair synchronously. Furthermore, a hybrid modalities-based switch is firstly designed to turn on/off the control system of the wheelchair. RESULTS: Two experiments were performed to assess the proposed BCI system. One was implemented for training and the other one conducted a wheelchair control task in the real environment. All subjects completed these tasks successfully and no collisions occurred in the real wheelchair control experiment. COMPARISON WITH EXISTING METHOD(S): The protocol of our BCI gave much more control commands than those of previous MI and SSVEP-based BCIs. Comparing with other BCI wheelchair systems, the superiority reflected by the index of path length optimality ratio validated the high efficiency of our control strategy. CONCLUSIONS: The results validated the efficiency of our hybrid BCI system to control the direction and speed of a real wheelchair as well as the reliability of hybrid signals-based switch control. Speaking and cognitive distractions during EEG-based brain control of a virtual neuroprosthesis-arm. BACKGROUND: Brain-computer interface (BCI) systems have been developed to provide paralyzed individuals the ability to command the movements of an assistive device using only their brain activity. BCI systems are typically tested in a controlled laboratory environment were the user is focused solely on the brain-control task. However, for practical use in everyday life people must be able to use their brain-controlled device while mentally engaged with the cognitive responsibilities of daily activities and while compensating for any inherent dynamics of the device itself. BCIs that use electroencephalography (EEG) for movement control are often assumed to require significant mental effort, thus preventing users from thinking about anything else while using their BCI. This study tested the impact of cognitive load as well as speaking on the ability to use an EEG-based BCI. FINDINGS: Six participants controlled the two-dimensional (2D) movements of a simulated neuroprosthesis-arm under three different levels of cognitive distraction. The two higher cognitive load conditions also required simultaneously speaking during BCI use. On average, movement performance declined during higher levels of cognitive distraction, but only by a limited amount. Movement completion time increased by 7.2%, the percentage of targets successfully acquired declined by 11%, and path efficiency declined by 8.6%. Only the decline in percentage of targets acquired and path efficiency were statistically significant (p < 0.05). CONCLUSION: People who have relatively good movement control of an EEG-based BCI may be able to speak and perform other cognitively engaging activities with only a minor drop in BCI-control performance. University at Buffalo researchers are developing brain-computer interface (BCI) devices to mentally control robots. Most BCI research has involved expensive, invasive BCI devices that are inserted into the brain, and used mostly to help disabled people. UB research relies on a relatively inexpensive ($750), non-invasive external device (Emotiv EPOC). It reads EEG brain activity with 14 sensors and transmits the signal wirelessly to a computer, which then sends signals to the robot to control its movements. Kesavadas recently demonstrated the technology with Pramod Chembrammel, a doctoral student in his lab. Chembrammel trained with the instrument for a few days, then used the device to control a robotic arm. The video (below) shows that a simple set of instructions can be combined to execute more complex robotic actions, Kesavadas said. Such robots could be used by factory workers to perform hands-free assembly of products, or carry out tasks like drilling or welding. The potential advantage, Kesavadas said, is that BCI-controlled devices could reduce the tedium of performing repetitious tasks and improve worker safety and productivity. The devices can also leverage the worker’s decision-making skills, such as identifying a faulty part in an automated assembly line. Real-time Neurofeedback Using Functional MRI Could Improve Down-Regulation of Amygdala Activity During Emotional Stimulation: A Proof-of-Concept Study. Abstract. The amygdala is a central target of emotion regulation. It is overactive and dysregulated in affective and anxiety disorders and amygdala activity normalizes with successful therapy of the symptoms. However, a considerable percentage of patients do not reach remission within acceptable duration of treatment. The amygdala could therefore represent a promising target for real-time functional magnetic resonance imaging (rtfMRI) neurofeedback. rtfMRI neurofeedback directly improves the voluntary regulation of localized brain activity. At present, most rtfMRI neurofeedback studies have trained participants to increase activity of a target, i.e. up-regulation. However, in the case of the amygdala, down-regulation is supposedly more clinically relevant. Therefore, we developed a task that trained participants to down-regulate activity of the right amygdala while being confronted with amygdala stimulation, i.e. negative emotional faces. The activity in the functionally-defined region was used as online visual feedback in six healthy subjects instructed to minimize this signal using reality checking as emotion regulation strategy. Over a period of four training sessions, participants significantly increased down-regulation of the right amygdala compared to a passive viewing condition to control for habilitation effects. This result supports the concept of using rtfMRI neurofeedback training to control brain activity during relevant stimulation, specifically in the case of emotion, and has implications towards clinical treatment of emotional disorders. Pupil responses allow communication in locked-in syndrome patients. For patients with severe motor disabilities, a robust means of communication is a crucial factor for their well-being. We report here that pupil size measured by a bedside camera can be used to communicate with patients with locked-in syndrome. With the same protocol we demonstrate command-following for a patient in a minimally conscious state, suggesting its potential as a diagnostic tool for patients whose state of consciousness is in question. Importantly, neither training nor individual adjustment of our system’s decoding parameters were required for successful decoding of patients’ responses. A Hybrid Brain-Computer Interface-Based Mail Client. Abstract. Brain-computer interface-based communication plays an important role in brain-computer interface (BCI) applications; electronic mail is one of the most common communication tools. In this study, we propose a hybrid BCI-based mail client that implements electronic mail communication by means of real-time classification of multimodal features extracted from scalp electroencephalography (EEG). With this BCI mail client, users can receive, read, write, and attach files to their mail. 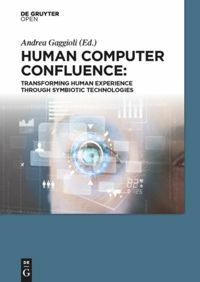 Using a BCI mouse that utilizes hybrid brain signals, that is, motor imagery and P300 potential, the user can select and activate the function keys and links on the mail client graphical user interface (GUI). An adaptive P300 speller is employed for text input. The system has been tested with 6 subjects, and the experimental results validate the efficacy of the proposed method. Researchers at Duke University Medical Center in the US report in the February 28, 2013 issue of Scientific Reports the successful wiring together of sensory areas in the brains of two rats. The result of the experiment is that one rat will respond to the experiences to which the other is exposed. The results of these projects suggest the future potential for linking multiple brains to form what the research team is calling an "organic computer," which could allow sharing of motor and sensory information among groups of animals. "Our previous studies with brain-machine interfaces had convinced us that the rat brain was much more plastic than we had previously thought," said Miguel Nicolelis, M.D., PhD, lead author of the publication and professor of neurobiology at Duke University School of Medicine. "In those experiments, the rat brain was able to adapt easily to accept input from devices outside the body and even learn how to process invisible infrared light generated by an artificial sensor. So, the question we asked was, ‘if the brain could assimilate signals from artificial sensors, could it also assimilate information input from sensors from a different body?’"
To test this hypothesis, the researchers first trained pairs of rats to solve a simple problem: to press the correct lever when an indicator light above the lever switched on, which rewarded the rats with a sip of water. They next connected the two animals' brains via arrays of microelectrodes inserted into the area of the cortex that processes motor information. One of the two rodents was designated as the "encoder" animal. This animal received a visual cue that showed it which lever to press in exchange for a water reward. Once this “encoder” rat pressed the right lever, a sample of its brain activity that coded its behavioral decision was translated into a pattern of electrical stimulation that was delivered directly into the brain of the second rat, known as the "decoder" animal. Importantly, the communication provided by this brain-to-brain interface was two-way. For instance, the encoder rat did not receive a full reward if the decoder rat made a wrong choice. The result of this peculiar contingency, said Nicolelis, led to the establishment of a "behavioral collaboration" between the pair of rats. "We saw that when the decoder rat committed an error, the encoder basically changed both its brain function and behavior to make it easier for its partner to get it right," Nicolelis said. "The encoder improved the signal-to-noise ratio of its brain activity that represented the decision, so the signal became cleaner and easier to detect. And it made a quicker, cleaner decision to choose the correct lever to press. Invariably, when the encoder made those adaptations, the decoder got the right decision more often, so they both got a better reward." "So, even though the animals were on different continents, with the resulting noisy transmission and signal delays, they could still communicate," said Miguel Pais-Vieira, PhD, a postdoctoral fellow and first author of the study. "This tells us that it could be possible to create a workable, network of animal brains distributed in many different locations." Nicolelis added, "These experiments demonstrated the ability to establish a sophisticated, direct communication linkage between rat brains, and that the decoder brain is working as a pattern-recognition device. So basically, we are creating an organic computer that solves a puzzle." "But in this case, we are not inputting instructions, but rather only a signal that represents a decision made by the encoder, which is transmitted to the decoder’s brain which has to figure out how to solve the puzzle. So, we are creating a single central nervous system made up of two rat brains,” said Nicolelis. He pointed out that, in theory, such a system is not limited to a pair of brains, but instead could include a network of brains, or “brain-net.” Researchers at Duke and at the ELS-IINN are now working on experiments to link multiple animals cooperatively to solve more complex behavioral tasks. "We cannot predict what kinds of emergent properties would appear when animals begin interacting as part of a brain-net. In theory, you could imagine that a combination of brains could provide solutions that individual brains cannot achieve by themselves," continued Nicolelis. Such a connection might even mean that one animal would incorporate another's sense of "self," he said. "In fact, our studies of the sensory cortex of the decoder rats in these experiments showed that the decoder's brain began to represent in its tactile cortex not only its own whiskers, but the encoder rat's whiskers, too. We detected cortical neurons that responded to both sets of whiskers, which means that the rat created a second representation of a second body on top of its own." Basic studies of such adaptations could lead to a new field that Nicolelis calls the "neurophysiology of social interaction." Such complex experiments will be enabled by the laboratory's ability to record brain signals from almost 2,000 brain cells at once. The researchers hope to record the electrical activity produced simultaneously by 10-30,000 cortical neurons in the next five years. For the first time, a person lying in an fMRI machine has controlled a robot hundreds of kilometers away using thought alone. "The ultimate goal is to create a surrogate, like in Avatar, although that’s a long way off yet,” says Abderrahmane Kheddar, director of the joint robotics laboratory at the National Institute of Advanced Industrial Science and Technology in Tsukuba, Japan. To attempt this feat, researchers with the international Virtual Embodiment and Robotic Re-embodiment project used fMRI to scan the brain of university student Tirosh Shapira as he imagined moving different parts of his body. He attempted to direct a virtual avatar by thinking of moving his left or right hand or his legs. The scanner works by measuring changes in blood flow to the brain’s primary motor cortex, and using this the team was able to create an algorithm that could distinguish between each thought of movement (see diagram). The commands were then sent via an internet connection to a small robot at the Béziers Technology Institute in France. The set-up allowed Shapira to control the robot in near real time with his thoughts, while a camera on the robot’s head allowed him to see from the robot’s perspective. When he thought of moving his left or right hand, the robot moved 30 degrees to the left or right. Imagining moving his legs made the robot walk forward. A Real-Time fMRI-Based Spelling Device Immediately Enabling Robust Motor-Independent Communication. Human communication entirely depends on the functional integrity of the neuromuscular system. This is devastatingly illustrated in clinical conditions such as the so-called locked-in syndrome (LIS) , in which severely motor-disabled patients become incapable to communicate naturally-while being fully conscious and awake. For the last 20 years, research on motor-independent communication has focused on developing brain-computer interfaces (BCIs) implementing neuroelectric signals for communication (e.g., [2-7]), and BCIs based on electroencephalography (EEG) have already been applied successfully to concerned patients [8-11]. However, not all patients achieve proficiency in EEG-based BCI control . Thus, more recently, hemodynamic brain signals have also been explored for BCI purposes [13-16]. Here, we introduce the first spelling device based on fMRI. By exploiting spatiotemporal characteristics of hemodynamic responses, evoked by performing differently timed mental imagery tasks, our novel letter encoding technique allows translating any freely chosen answer (letter-by-letter) into reliable and differentiable single-trial fMRI signals. Most importantly, automated letter decoding in real time enables back-and-forth communication within a single scanning session. Because the suggested spelling device requires only little effort and pretraining, it is immediately operational and possesses high potential for clinical applications, both in terms of diagnostics and establishing short-term communication with nonresponsive and severely motor-impaired patients.